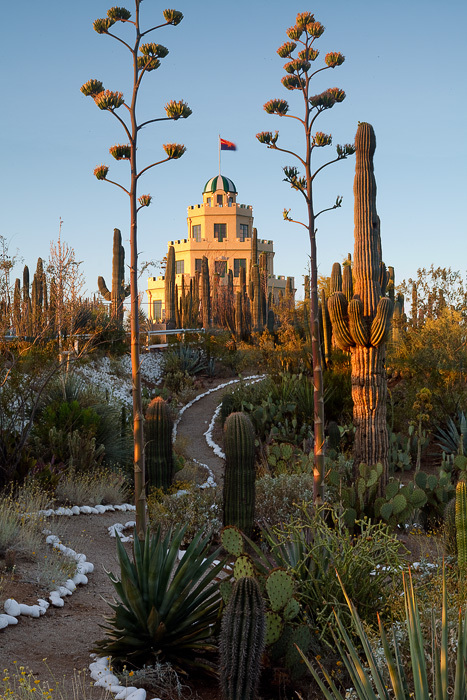 The Tovrea Castle, an icon in Phoenix, was built in 1926 and is owned by the city. The surrounding garden, called the "Carraro Cactus Garden" boasts over 5000 cacti and over 100 different varities. Sadly, the castle is closed to the public because of a lack of state funds. However, many volunteers work to keep its grounds pristine. This image was taken as the first rays of sunrise graced the garden. The castle's lights were still on. Photo © copyright by Michael Greene.